MisterBob Comments: OK, a tower from earth goes all the way to the stars, but the spaceman doing the fonts has fallen off the top. Awww, I was going to do a Felix Baumgartner joke. I wonder what the guy on the left is going to do with his gigantic micrometer. I also wonder if that’s the longest stick of Blackpool rock ever made (look, it even references Blackpool Tower!). There’s so much in this cover, and yet all I can think when I look at it is “shiny red arse”. That says more about me than about the cover, I fully concede. Baboony. Does EVERY tall building have words on its roof telling you what it is? I must look at Google Earth more often. 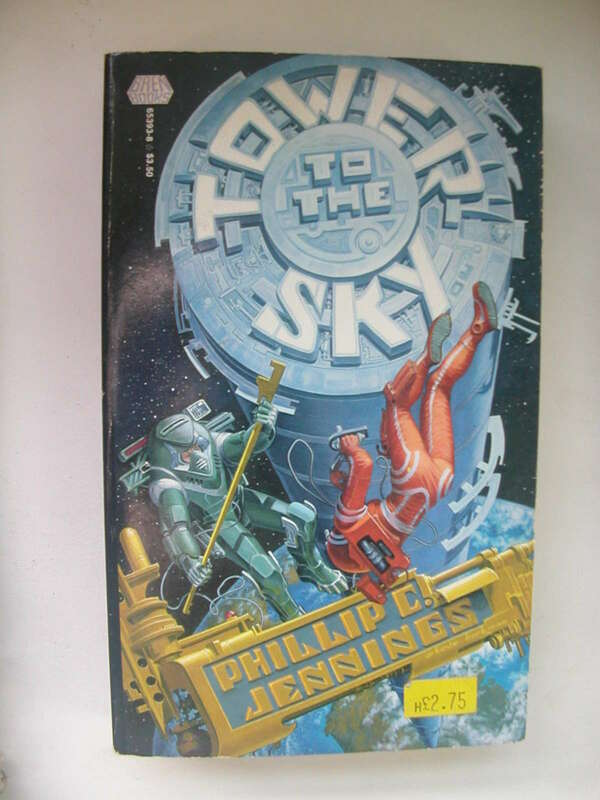 I’m somewhat unconvinced by the practicality of a sky tower reaching thousands of miles into space which appears to be only about 7 feet in diameter. Conditions for the occupants would be cramped to say the least, and what happens at the end of a movie on one of the (presumably several hundred) theater levels when 200 people all try to get in to the toilets at once? Argentina builds a space tower? If I were approving this cover for publication my one word to the art department would be ’emboss’. This cover would be sublimely excellent were this book published in 1948…but 1988? Apparently Dustin Hoffmans character was given good advice in The Gradute. Plastic…in the future buildings and even people will be made of plastic. I checked the perspective three times to make sure that it wasn’t off. But it still looks all wrong! Is there a word for that? In space no one can hear you scream…or question the artist’s inability to master the basic techniques. Phil, that isn’t a “gigantic micrometer” it is what they use to replace the letters. probably a new corporate sponsor… tough job. Sure, it goes to the sky, but what the hell does that actually mean when every “floor” of the tower is just wide enough for a person of average height to try to lie down and end up banging their head on the wall? Just what are you using all that space for? Microgravity-farmed weasels? B) An exhaust pipe for hot air, emerging directly from Washington D.C.
@A..R. Yngve. If I visit your website in the near future and find any of those ideas incorporated into your own works I will be crushed, disillusioned…and intrigued. Wow, that deep-sea diver really took a wrong turn somewhere. @A.R. Yngve. Sir, if I viisit your site in the future and find any of these ideas incorporated into your own work I will be dismayed, disillusioned, disgusted….and intrigued. That’s one oddly designed space elevator . . .